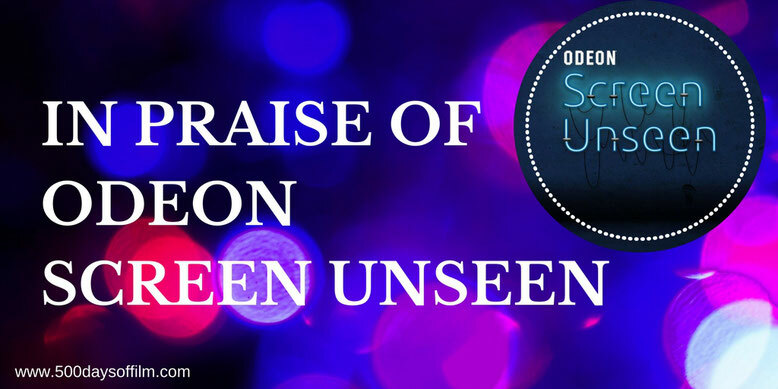 Have you been to an Odeon Screen Unseen this year? If you haven’t heard of or attended one of these film events, you are missing a (consistently) brilliant cinema experience. Here's how it works... you pay £5 to see a movie at the cinema (sometimes weeks) before its general release. However, you will not know for sure what that movie is until the BBFC rating certificate appears. Not too shabby as I think you will agree! Let’s face it, a trip to the cinema is no cheap evening out these days. A full price adult ticket can cost between £10-14 and that’s before you sidle up to Ben & Jerry. So, the £5 Screen Unseen ticket price is a pretty attractive prospect. There is something addictive about the mystery of Odeon Screen Unseen. It wouldn't be half as enjoyable if we knew what we were in for! The fun starts well before you take your seat in the cinema. A short time before the event, Odeon releases a series of clues via social media about the secret film's identity. Now, I have to admit that these clues vary from being pretty easy to utterly inscrutable. At any rate, they all add to the exciting experience - just don’t let them drive you mad! I love to read the predictions from fellow cinema goers. There is a lot of fun to be had guessing (and hoping) along with fellow film fans and then discussing your thoughts on the movie afterwards. Sadly, a full screening room is a rare occurrence these days. Not so Screen Unseen. Many of these events have been sold out - so book your tickets early! My favourite moment of the entire Screen Unseen event has to be the seconds before the BBFC certificate comes on screen. I am literally squirming in my seat and I can feel the anticipation build all around me. It is so tense! I am sure that they hold that certificate for longer than in a normal film screening. Then, finally, we know what we are about see and there is a wonderful buzz around the cinema as the audience comes to terms with the movie they are about to watch. As I mentioned above, as tense as I feel before the BBFC certificate is shown, I am never really worried. Odeon has proved pretty trustworthy in its selection of Screen Unseen movies. I now feel sure that, whatever film is selected, it will be of a high standard and certainly worth seeing. As well as being critically acclaimed, Odeon’s Screen Unseen films are also pre-releases. I have seen several films weeks before they appear on general release. Apart from being useful from a film review perspective, there is also something satisfying about watching a film early. Not everyone is happy once the film is revealed. One of my guilty pleasures is counting the number of walkouts after the film has been revealed. You would be surprised at how many people leave. About ten people scarpered at the screening of Inside Out for goodness sake! I love Odeon’s Screen Unseen events because they make me feel part of a community. As I take my seat, I know that the people all around me love cinema (okay there’s also the cheap ticket price, but still) and are willing to watch anything. Meanwhile, these events also build communities online as people predict the films and then dissect them afterwards. What Do You Think Of Odeon Screen Unseen? For all these reasons (and probably many more), I love Odeon Screen Unseen. Here’s to many, many more mystery films! Have you been to one of these movie events? If you have, what did you think of the screening? I’d love to know. Do feel free to leave me a comment in the box below. I've never walked out of a Screen Unseen but I got money back one time when I found out the film (It follows) I will watch anything but I don't like Horror movies. The walkouts always fascinate me... I want to find out what prompted them! I can totally understand, however, your decision to get a refund for It Follows. I think this Screen Unseen film is what inspired Odeon to create Scream Unseen.